When the vertically-challenged Johnny Naples entrusts Tim Diamond with a package worth over three million pounds, he’s making a big mistake. Tim Diamond is the worst detective in the world. Next day, Johnny’s dead, Tim feels the heat, and his smart younger brother, Nick, gets the package—and every crook in town on his back! This is a pretty good mystery/thriller, with one foot in comedy and one foot in mayhem. The body count is high, making it definitely YA, not children's, and if it weren't for the somewhat cartoonish nature of the whole thing it would have been too violent for my taste. It might be, anyway. What's awkward is that the writing level feels more like it's for 10- or 11-year-olds. Maybe today's kids are used to corpses from the video games? Nick Diamond is a pretty sharp kid, unlike his brother. He's pretty convinced of his brilliance, too, which makes him an entertaining narrator, in a way. At least, it's sort of entertaining to see him discover that he's not as smart as he thinks he is. Horowitz's tongue-in-cheek version of the hard-boiled detective-story style is more fun, as is the play on names that starts with the title and doesn't stop. The story is fast-moving, the writing clever and smooth, and after the half-way point I just sat back and read to see where it would go. There's nothing fundamentally wrong with the book, and I almost stopped reading halfway through. I think that the style simply felt too adolescent to me, and the combination of the absurd with the corpse on every third page wasn't my thing. I really did feel torn--fun one minute, disturbing the next. I'm not sure what age the book is meant for (I notice that our library puts it in Young Adult, not juvvy, probably because of the body count). I'd say it's for somewhat older kids (high school) who want a fun, easy read that doesn't feel like a kiddie book but dodges the romance that seems to be a part of most YA novels. I wouldn't give it to little kids--to me, the cartoon violence is worse than the real violence that is in many kids' books (especially some of the historical fiction set in troubled times). Adults familiar with Dashiell Hammet and Raymond Chandler will probably enjoy the parody. 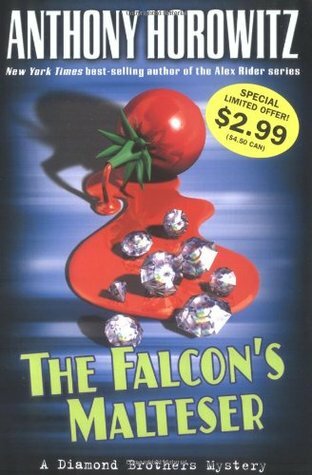 FTC Disclosure: I checked The Falcon's Malteser out of my library, and received nothing from the writer or publisher in exchange for my honest review. The opinions expressed are my own and those of no one else. I am disclosing this in accordance with the Federal Trade Commission's 16 CFR, Part 255: "Guides Concerning the Use of Endorsements and Testimonials in Advertising." I'd be interested to get your take. I thought it was a bit of an odd mix.